On August 8, 1901, Gustave Whitehead an immigrant of Germany reported to authorities that he gained flight in his flying machine. Whitehead reported he had made a series of flights in a field in Fairfield, Connecticut. He stated that he was able to sustain flight where he gained an altitude of 200 feet and and flew 1.5 miles just before dawn. "I was soaring above my fellow beings in a thing my own brain had evolved". 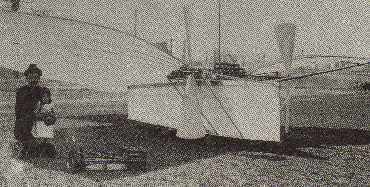 The craft had two propellers driven by a 12 HP engine that weighed 54 lbs. Eye witnesses testified that Whitehead had made the successful flights. However, the flight was before dawn and no pictures of the flight was never taken and as a result a great deal of skepticism surfaced.